Plants: densely colonial, mat-forming shrub; 10-35 cm tall. Leaves: pale with dark bristle-like glands, bright green above, leathery, evergreen, elliptic to obovate, 5-18 x 3-9 mm, margins entire, slightly revolute. Flowers: corolla pinkish white, bell-shaped, 3-5 mm long, 4-parted, lobes divided almost to the middle; stamens 8; inflorescence with 2-3 flowers in a cluster at the ends of the stems. Fruits: berries, red, 8-10 mm, with ca. 10-20 seeds, edible. Habitat: acidic, nutrient poor sites with direct sunlight; bogs, muskegs, conifer swamps, sandstone cliffs along Lake Superior. Phenology: Flowering time: early May through late June; Fruiting time: late July through early September. Vaccinium vitis-idaea (under the synonym V. vitis-idaea subsp. minus) is State Endangered in Wisconsin. Its distribution is circumboreal. Floristic Rating: Coefficient of Conservatism = 10, Wetland Indicator = FAC. 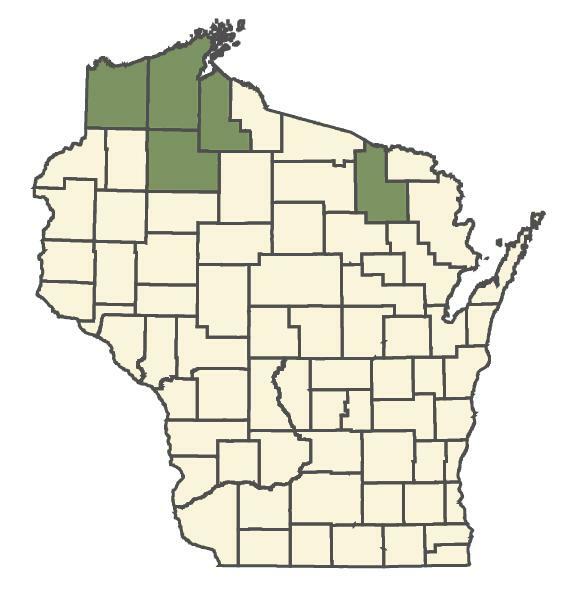 WIS DNR-Bureau of Endangered Resources: Detailed information on Wisconsin listed species including state and federal status, photos, etc. Flora of North America: Flora of North America taxonomic treatment. USDA Plants Database: North American distribution, detailed information, and photographs. Virginia Tech Dept. of Forestry, College of Natural Resources: Fact sheet. Southwest School of Botanical Medicine: Britton & Brown Illustrated Flora - 2nd Edition (1913) "An Illustrated Flora of the Northern United States and Canada."